WASHINGTON, DC – The global economy is now undergoing a transition from fossil and nuclear energy to clean power from solar, wind, and other renewable sources, according to the latest book from environmental analyst Lester Brown and his colleagues at the Earth Policy Institute (EPI). The Great Transition: Shifting from Fossil Fuels to Solar and Wind Energy lays out the rapidly evolving global shift toward cleaner sources of energy, driven by economics, policy, and the hard realities of accelerating climate change. Brown and co-authors Janet Larsen, J. Matthew Roney, and Emily E. Adams, stress that the shift taking place now represents a lasting change in the way we power the world economy. 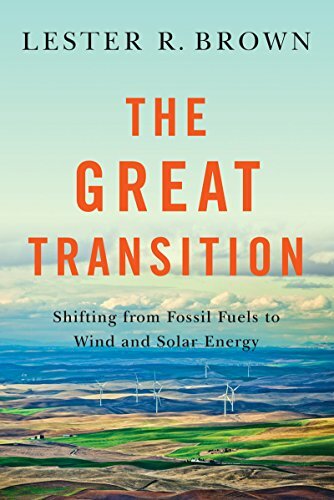 The Great Transition details this evolving trend, focusing on falling prices and rising adoption for wind, solar, electric vehicles, hydropower, geothermal energy, and energy efficiency; and the emerging turn from coal, nuclear power, oil, and traditional transportation that is happening faster than anticipated. 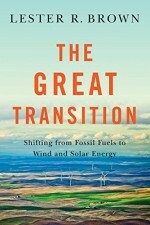 Chapter 1 of The Great Transition: Shifting from Fossil Fuels to Solar and Wind Energy is available online at www.earth-policy.org/books/tgt. Supporting data and a PowerPoint summary presentation are available for free downloading. The price of solar photovoltaic panels has declined 99 percent over the last four decades, from $74 a watt in 1972 to less than 70 cents a watt in 2014. Between 2009 and 2014, solar panel prices dropped by three fourths, helping global PV installations grow 50 percent per year. Over the past decade, world wind power capacity grew more than 20 percent a year, its increase driven by its many attractive features, by public policies supporting its expansion, and by falling costs. By the end of 2014, global wind generating capacity totaled 369,000 megawatts, enough to power more than 90 million U.S. homes. National and sub-national policies around the world are shifting to support renewables and put a price on carbon. These include 70 countries with feed-in tariffs; two dozen countries with renewable portfolio standards (RPS); 37 countries with production or investment tax credits for renewables; and some 40 countries implementing or planning carbon pricing. U.S. coal use is dropping – it fell 21 percent between 2007 and 2014 – and more than one-third of the nation’s coal plants have already closed or announced plans for future closure. Meanwhile the Stowe Global Coal Index – a composite index of companies from around the world whose principal business involves coal – dropped 70 percent between April 2011 and September 2014. For the world as a whole, nuclear power generation peaked in 2006, and dropped by nearly 14 percent by 2014. In the US, the country with the most reactors, nuclear generation peaked in 2010 and is now also on the decline. In China, electricity generation from wind farms now exceeds that from nuclear plants, while coal use appears to be peaking. This entry was posted in NewsBlog on April 29, 2015 by Helen Deffenbacher. WASHINGTON, D.C. — According to the latest “Energy Infrastructure Update” report from the Federal Energy Regulatory Commission’s (FERC) Office of Energy Projects, wind, solar, geothermal, and hydropower combined provided over 75 percent (75.43 percent) of the 1,229 megawatts (MW) of new U.S. electrical generating capacity placed into service during the first quarter of 2015. The balance (302 MW) was provided by natural gas. Specifically, during the quarter, eight new “units” of wind came on line with a combined capacity of 647 MW — accounting for 52.64 percent of all new generating capacity for the quarter. It was followed by 30 units of solar (214 MW), one unit of geothermal steam (45 MW), and one unit of hydropower (21 MW). Five units of natural gas provided the new capacity from that sector. Kenneth Bossong is the Executive Director of the SUN DAY Campaign. The SUN DAY Campaign is a non-profit research and educational organization founded in 1993 to promote sustainable energy technologies as cost-effective alternatives to nuclear power and fossil fuels. This entry was posted in NewsBlog and tagged Federal Energy Regulatory Commission (FERC), growth of renewable energy in U.S., Kenneth Bossong, Nebraskans for Solar, Renewable Energy World.Com, SUN DAY Campaign on April 26, 2015 by Helen Deffenbacher. WASHINGTON — Far more jobs have been created in wind and solar in recent years than lost in the collapse of the coal industry, and renewable energy is poised for record growth in the United States this year . . . Researchers at Duke University, using data from renewable energy trade associations, estimate in a new study published in the journal Energy Policy that more than 79,000 direct and spinoff jobs were created from wind and solar electricity generation between 2008 and 2012. That compares with an estimate of about 49,530 coal industry job losses, according to the study. This entry was posted in NewsBlog and tagged Duke University, Energy Policy Journal, job losses in coal industry, jobs growth in renewables, McClatchy Washington Bureau, Nebraskans for Solar, Sean Cockerham, U.S. solar & wind energy jobs on April 26, 2015 by Helen Deffenbacher. Pika Energy, a Maine-based manufacturer of residential wind turbines and wind-solar hybrid systems, and GenPro Energy Solutions, a South Dakota-based provider of customized energy solutions, announced they have completed the installation of a wind-solar hybrid energy system for Ravenna Public Schools in Ravenna, Nebraska. 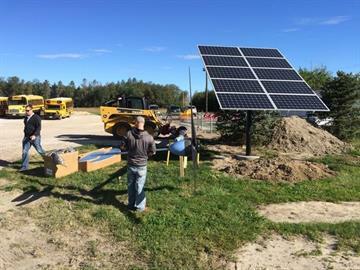 Funded by a private grant, it is the first integrated wind-solar hybrid installation in the country at a public school. This entry was posted in Nebraska / Midwest News, NewsBlog, Solar Schools and tagged Nebraska Solar Schools (K-12), Nebraskans for Solar, wind-solar hybrid installations on April 24, 2015 by Helen Deffenbacher. LINCOLN — State senators amended and then advanced a bill Wednesday that would provide a first-ever production tax credit for wind farms and other renewable energy facilities. The 25-3 vote to advance the proposal from the first round came after a long debate over whether such a tax break could succeed in creating an incentive or whether Nebraska is too late to become a big player in wind energy. This entry was posted in Nebraska / Midwest News, NewsBlog and tagged Nebraska Legislative Bill 402, Nebraska Legislative Bill 423, Nebraska's Community-Based Energy Development (C-BED) Law, Nebraska's renewable energy development, Omaha World Herald, Paul Hammel on April 24, 2015 by Helen Deffenbacher. Low-income residents’ health and pocketbooks are disproportionately affected by burning fossil fuels, and they stand to benefit the most as states comply with federal carbon regulations, according to two new reports released last week. Those findings run counter to coal industry campaigns suggesting the opposite — that low-income residents are facing rate increases as states and utilities comply with the Clean Power Plan, according to the Natural Resources Defense Council. This entry was posted in NewsBlog, Research and tagged Andy Balaskovitz, Clean Power Plan, EPA, Midwest Energy News, Natural Resources Defense Council (NRDC), Nebraskans for Solar on April 20, 2015 by Helen Deffenbacher. The St. Paul college will join Northfield’s St. Olaf College as a carbon-neutral campus. Macalester College said Thursday that solar power will offset all of its electricity use in two years, resulting in substantial savings on its utility bills. The St. Paul liberal arts school is the second college in Minnesota to announce solar deals that will result in carbon-neutral campuses. In February, St. Olaf College in Northfield said it would add more solar to its existing wind energy, offsetting all its electricity with renewable power. This entry was posted in NewsBlog and tagged carbon-neutral campuses, David Shaffer, Geronimo Energy, Macalester College, Minnesota solar gardens, Nebraskans for Solar, solar schools, St. Olaf College, Star Tribune, SunEdison, Xcel Energy on April 17, 2015 by Helen Deffenbacher. Recent numbers from two nationally-recognized polling agencies offer an instructive look into how Americans view electricity generation sources. Findings from Gallup and Zogby Analytics concur – the public increasingly thinks the nation’s future is in renewables and energy efficiency, while they are losing confidence in nuclear and coal. Natural gas, meanwhile, appears to be in good standing as well, save for apprehensions surrounding fracking. This entry was posted in NewsBlog, Research and tagged Gallup, Herman K. Trabish, Nebraskans for Solar, polls on America's energy revolution, Utility Dive, Zogby Analytics on April 15, 2015 by Helen Deffenbacher.